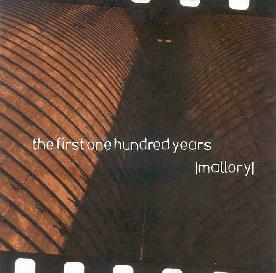 Mallory - "The First One Hundred Years"
The Cincinnati trio, Mallory, opens their release with heavy synthesized keyboard sounds. The first track, "Kokomo hum," has a space-laden sound that grooves beneath simple yet dense sounding guitar textures. The pace of this tune is sluggish upon its start but heightens toward the latter part of the 5:21 song into more of an uptempo-distorted jam that extends out and blends right into the following piece, "Monte Carlo." The absence of lyrics in the first track breaks up a little with sparsely sung lyrics in this second piece. The blending of the two tracks has the continuous composition of an Indie Space-Rock ensemble such as Mogwai. This produces a feeling of a narrative being told instead of each of these pieces becoming isolated as unrelated. "The Suicide Artist" runs as the longest song at 6:42, begins with macabre vocals, and breathed lyrics likened to ones sung through a funnel. It drags with simple and dreary riffs until the mood heightens for a little over a minute into the song; the depressed lyrics are sung louder, the guitar and drums put into full work. All of this plays out until the mood downturns back into its melancholic beginning. This track made the best use of the group's vocal work. They were used within their bounds producing a good blend between instrumental and vocal harmony. In prior tracks like "The Way After," the vocal work seemed more comparable to a K records release leaving less room for a refreshing take on the vox. The first two songs and last track are formidable songs on this release. The First One Hundred Years could have done better if it continued with the thematic mood set in the opening track; it was very spacey, climactic, and accessible. The vocals are not a requirement for Mallory and it would suit them best to remain as an instrumental band. The release is OK but great could have best described it if the remaining songs on the release followed the blueprint of "Kokomo hum." For more information you can visit the Mallory web site at: http://www.mallorysounds.com. Contact via snail mail c/o Mallory; 2364 Chickasaw St; Cincinnati, OH 45219.